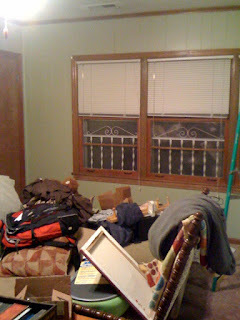 Makin' it in Memphis: Wood Paneling, part two. We spent most of Friday completing our den painting project - the wood paneling. 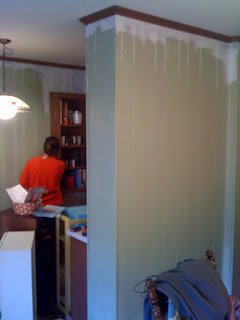 As seen in Wood Paneling, part one, a few weeks ago, we primed the wood paneling with oil based primer. We finally had another big chunk of time Friday, the day after Thanksgiving. While others spent their day shopping the Black Friday deals, we were painting our little hearts out. The paint color, Koi Pond by Sherwin Williams, is perfect for the room - dark enough to have interest but not so dark that it creates the cave feel the paneling had. All we're leaving you with here is a teaser of the final product - a picture of one wall right after we finished (hence our den contents piled in the middle of the room). Once I've done my sewing project, cleaned, and put my fun ideas on the wall, I'll post the final product. OMG! That wood paneling redo looks awesome! I just closed on my first house and it has wood paneling in the family room and I was trying to see results of painted paneling on the web that would inspire me and you did just that! Thanks! Great job!